The Rottweiler often carries the head on an even plane with the back or carries the head up but with the neck and shoulders lowered. Some females lower the entire front end slightly when using their eyes. Males also do this when working far off the stock in an open field. This is rarely seen in males when working in confined spaces such as stock yards. Rottweilers use their bodies to physically force the stubborn animal to do its bidding if necessary. When working with sheep the Rottweiler shows a gathering/fetching style and reams directions easily. It drives sheep with ease. In some cases Rottweilers have begun herding cattle without any experience at all. If worked on the same stock for any length of time the Rottweiler tends to develop a bond with the stock and will become quite affectionate with them as long as they do as it directs. 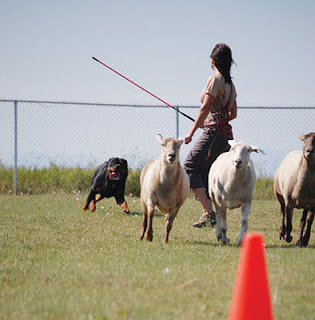 The Rottweiler is also exceptionally suited for and is commonly used in the dog sport.